I love making stuff. All kinds of stuff. And this month, I decided to make something big. Well, technically a make over. I joined the amazing team at Marketwake at the end of January. (Forgive my secrecy, it’s just been such a great transition, I’ve just been soaking up the new and shiny and feel good of it all.) And when I got there, I immediately asked, “What can I do to help?” (Emphasis on the “I.”) I wanted to bring something unique to the table. Something that would advance the company towards their goals, or make a mark on our culture. So when I learned one of the company’s OKRs was to give the bathrooms a makeover, I immediately volunteered. The brief was simple — we need our bathrooms to be more comfortable. Quieter, more styled, intentional, and functional. So I took that feedback and developed a plan to create a quiet, quaint, comfortable bathroom. Matching with the Marketwake office’s rustic, natural style, I landed on traditional farmhouse silhouettes, patterns, textures, and colors. Here’s my mood board. Ain’t it quaint? As soon as we agreed on a look and feel, I got a budget and the green light, so I started working. After getting over some humps with shipping, installation, and the classic woes of any DIY, we had a finished bathroom. Here’s an illustrated version of how the bathrooms came to life, one step at a time, over a sequence of eight days. Here are some photos of the finished product, including a couple of features I couldn’t fit in the above sketch. 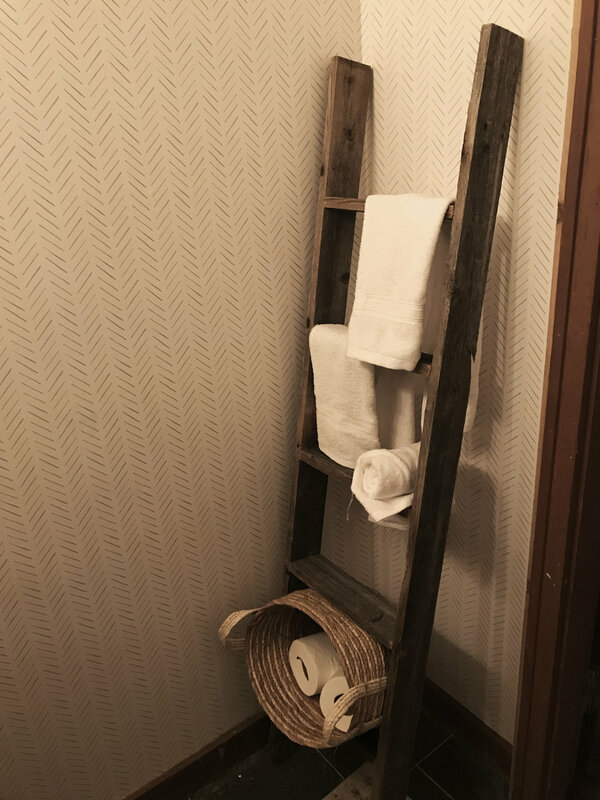 Loving the rustic ladder towel rack. And I’m super pleased to announce that the company loves everything, too. Oh, another thing I can’t fit into a picture? Our tiny, dainty, but super relaxing sound machines. Hiding any number of auditory sins committed in the WC, and creating a little therapeutic space for any and everyone to take a little (bio) break throughout the day. Huge thanks Marketwake for the permission and patronage to take on this awesome project. I’m so happy with what we created!